Brooke (second left) hands over the RM1,000 prize money to the team from Sarawak Convention Bureau, witnessed by Kuching Heritage Race 2018 organising chairman Philip Yong (left). KUCHING: Two local charity bodies have received donations derived from the proceeds of the recent Kuching Heritage Race 2018. The House of Joy and the Community-based Rehabilitation Centre (PDK) of Petra Jaya each received RM20,000 to assist in their work with individuals with special needs. Moreover, the father-daughter ‘Team Bicycle’, who placed third in the race, willingly donated their prize money to charity. 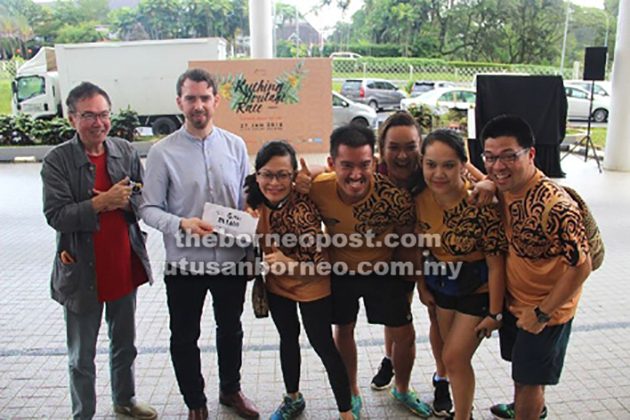 The overall winner was the team from Sarawak Convention Bureau, who clocked 138 minutes, while the first runners-up were ‘Beauties and the Beasts’, who also won the ‘Best Dressed Team’ prize. Team Orion earned the ‘Social Media Award’ by contributing the highest number of social media posts. Sixty-four teams, comprising more than 300 participants, joined Kuching Heritage Race 2018 which took place at Kuching Reservoir Park and Museum Park. The theme this year was ‘Culture Meets Nature’. The competitors followed a map and a ‘passport’ with clues that required them to find 20 different stations, where they had to accomplish a task or activity at every station. Over 130 volunteers helped to coordinate the stations to ensure the race ran smoothly. Grandson of the last Rajah Muda of Sarawak, Jason Brooke flagged off the race and presented several prizes. Also present were Heritage Race founder Yeoh Siew Hoon of Penang, Joanne Tan who represented main sponsor Sarawak Energy Bhd, as well as representatives of other sponsors like Sarawak Tourism Board, Sarawak Convention Bureau, Borneo Adventure, Secret Recipe, Plaza Merdeka and The Waterfront Hotel. It is learnt that the next edition of the race will kick off on Jan 12 next year.